If you follow my tweets, then you may have ‘read” me this morning… urging my 15 month old to eat her porridge quicker, cursing my husband for being at work and turning the sky blue when confronted with a local traffic snarl up. Everyday occurences, nothing unusual… except that they were happening on a day that I needed to be somewhere ASAP! Where? My local Chanel counter, that’s where! 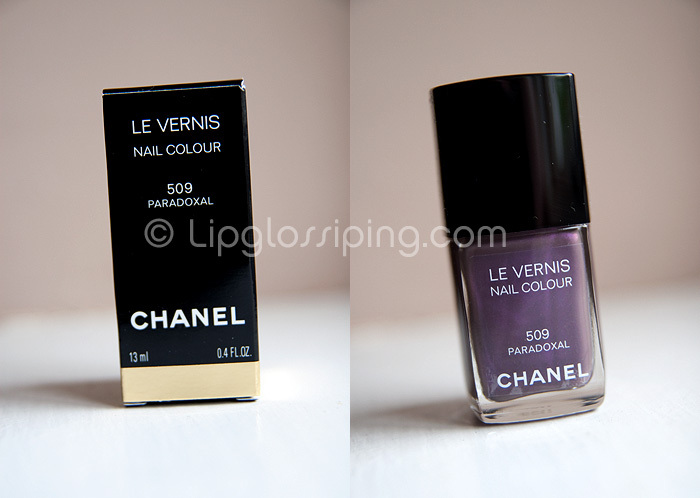 Chanel Nail Polishes are notoriously fast sellers. Infact, as I type this… I’m reminded of the fact (via twitter) that today, this particular nail polish sold out in Selfridges in 3 hours. 3 HOURS folks! I can spend longer in the bath than that. I love my grungey, murky, ugly colours. I find them easy to wear and they make me feel grown up without feeling old. They generally suit my cool skin tone without making my hands look like lobsters. We were made for one another. My absolute favouritest shades (that’s SO a word) generally throw a little purple into the mix. Shall I name some names? Channelesque, Who’s Wearing What, Surreal Violet, Bon Bon, Silver Purple. So you see, Paradoxal turned my head from the first time I saw it. Is it worth £16.50? Probably not. Do I love it very, very much and do I regret spending £16.50 on it? Yes and No, not at all. You’ll know immediately if this is your kinda colour… like McDonald’s gherkins. You either love ’em or hate ’em. I also happen to adore McDonald’s gherkins and would probably steal yours. If you’re indifferent about gherkins, don’t go spending £16.50 on one just ‘cos everyone else is telling you how tasty it is. That’s my free tip of the day. What I’m saying is… don’t rush out, buy it and then moan ‘cos it’s a durgy colour. OF COURSE IT BLOODY IS! OK… that’s Paradoxal. For me, it’s worth the hype. I’m not even going to talk about longevity or application. I’m not interested, everyone knows that Chanel polishes aren’t the best for those practical issues. I bought Paradoxal for it’s colour and it’s Limited Edition status alone. It could apply like tar and I still would have bought it. If you want it and don’t have it, I suggest grabbing the Yellow Pages and phoning your local counters to see if they still have stock. I’d also suggest trying ones that are more ‘out of the way’ – ‘cos this baby is selling fast! Looks great on you, but it’s a bit too grey toned for me. Also… is it just me or does it look a fair bit like the Estee Blue Dahlia one you’ve also recently been loving? goodness, that is one gorgeous colour! Love the analogy! yeah I love this colour! It looks great on you, but I don’t think it will work for me. Without having see it in real life this at the moment is a pass for me, maybe I will change my mind once I see it. Its an absolutely beautiful colour on you. I’m still undecided for myself personally, but I’ll have a mooch around to see it in person before swiping the plastic! I love this – bot it recently with Jade Rose, another ”must have”. 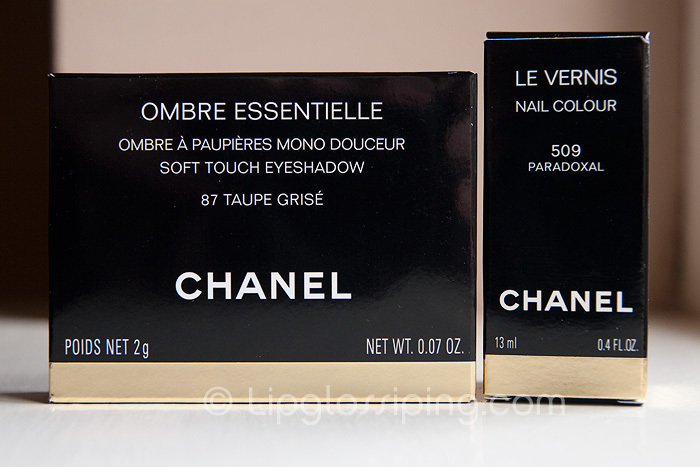 But my absolute Chanel fav is still ”Particuliere” – 505 !!! MY GOD. This is such a gorgeous colour. I thought Particuliere was gorgeous but this beats it!! I wonder if it is out in Australia yet since we get everything a step behind. I hope its not already sold out! I’ve been eyeing this shade up since I first saw it, while it’s beautiful – I don’t like McDonald’s gherkins… so i’d probably get bored of this! it looks very elegant and delicate. Oooh, I love this colour, but Chanel’s a little spendy for this retail slave’s budget. 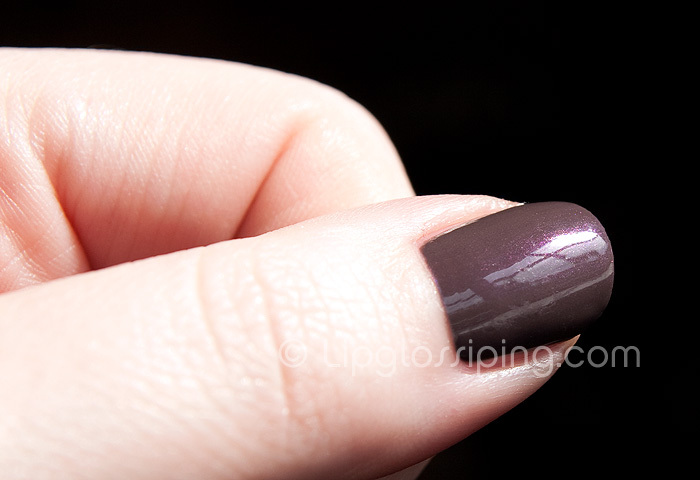 I’ll probably try to replicate this one by mixing OPI’s You Don’t Know Jacques along with Purple With A Purpose. I kind of love it when companies I can’t afford put out “it” products… it gets the creative juices going. *Nods head in agreement*!!! I ‘m on a waiting list as we speak, lol! Looks gooorge, I can’t wait until it arrives here!